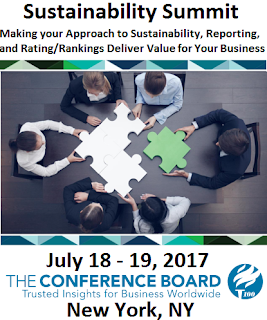 The 16th Annual Sustainability Summit will take place on July 18 - 19, 2017 at the Conference Board in New York, NY. The summit is titled: "Making your Approach to Sustainability, Reporting, and Ratings/Rankings Deliver Value for Your Business". The 2017 Sustainability Summit will provide a unique opportunity for sustainability practitioners at leading companies to enjoy a safe space to address the most urgent and persistent strategic, operational, and implementation challenges they face in addressing the environmental, social, and governance (ESG) performance of their companies. The Summit will enable peer-to-peer exchange and engagement with leading practitioners and subject matter experts to work in a collaborative way through the major challenges that corporate sustainability professionals face today. We will focus on key challenges through interactive sessions that enable participants to learn from and support one another.